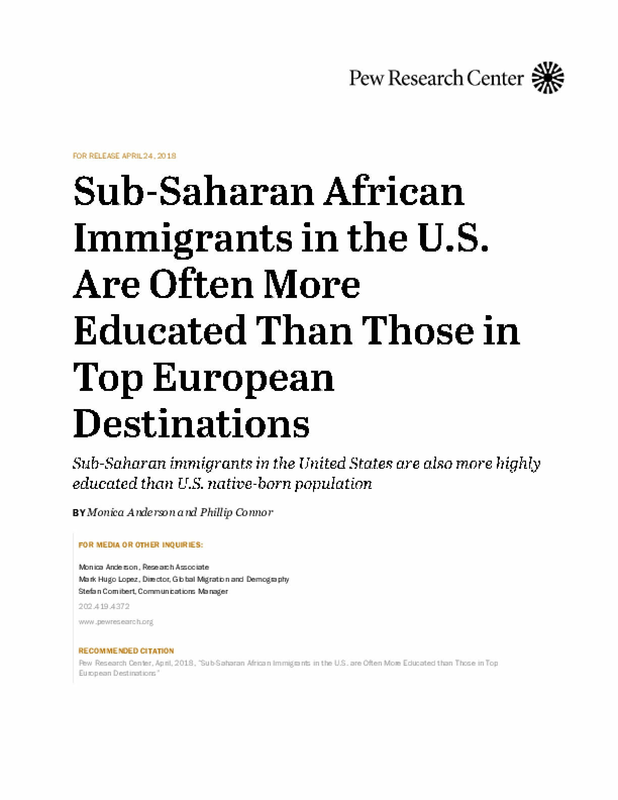 As the annual number of migrants from sub-Saharan Africa to both the United States and Europe has grown for most years this decade, a Pew Research Center analysis of 2015 U.S. Census Bureau and Eurostat data finds that sub-Saharan immigrants in the U.S. tend to be more highly educated than those living in the United Kingdom, France, Italy and Portugal – Europe's historically leading destinations among sub-Saharan immigrants. In the U.S., 69% of sub-Saharan immigrants ages 25 and older in 2015 said they had at least some college experience. In the same year, the share in the UK who reported some college experience was 49%, while it was lower still in France (30%), Portugal (27%) and Italy (10%). Immigrants from sub-Saharan Africa living in the U.S. are also somewhat more likely to be employed than their counterparts in Portugal, France and Italy. In 2015, 92.9% of U.S.-based sub-Saharan immigrants said they had a paying job, compared with 84.9% in Portugal, 83.7% in France and 80.3% in Italy. Meanwhile, the share of sub-Saharan immigrants in the UK who are working (91.5%) was nearly equal to that in the U.S. The U.S., UK, France, Italy and Portugal are some of the top destinations of sub-Saharan migrants living outside of sub-Saharan Africa. As of 2015, however, more than two-thirds (69%) of migrants from sub-Saharan countries actually lived in other sub-Saharan African countries. Together, the U.S., UK, France, Italy and Portugal were home to more than half (57%) of the sub-Saharan migrant population living outside sub-Saharan Africa in 2015, according to global migrant population estimates from the United Nations. And the four European countries featured in this report accounted for roughly three-quarters (74%) of all sub-Saharan immigrants living in EU countries, Norway and Switzerland in the same year. Historically, sub-Saharan immigrants have made up small shares of the total population in the U.S., UK, France, Italy and Portugal – 3% or less in each country, as of 2015. But annual migration to the U.S. and Europe from sub-Saharan Africa rose most years this decade. In all, well more than a million sub-Saharans have migrated to the U.S. and to EU countries, Norway and Switzerland since 2010. Migration pressures for some sub-Saharans to leave Africa are expected to continue as the continent's population grows, young people struggle to find employment and protracted conflicts continue. While a large majority of Americans rate police officers positively on a 0-to-100 "feeling thermometer," whites and blacks differ widely in their views, including among Democrats, according to a Pew Research Center survey conducted in August. The Great Recession and housing crisis erased approximately half of Black and Latino households' wealth, while Asians suffered the largest absolute loss in wealth. But the dramatic wealth disparities between White communities and communities of color long predate the dramatic economic downturn. 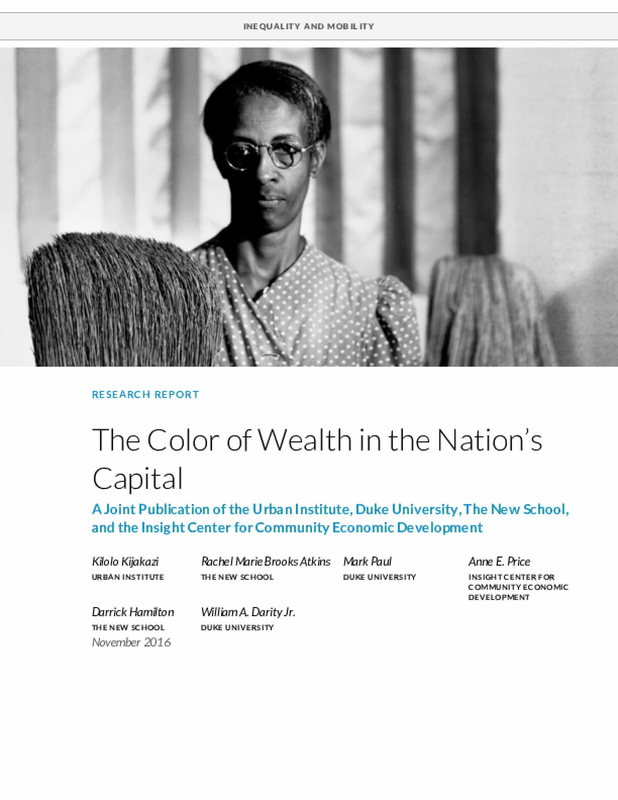 This report explores racial and ethnic differences in net worth, focusing on Black families in Washington, DC, and shows, through a chronicle of their history in the city, how discrimination and systemic racism have contributed to today's wealth gap in the nation's capital. The authors document assets, debts, and net worth for racial and ethnic groups living in the DC metropolitan area from a 2013–14 phone survey. Blacks and whites have sharply different reactions to the police shooting of an unarmed teen in Ferguson, Mo., and the protests and violence that followed. Blacks are about twice as likely as whites to say that the shooting of Michael Brown "raises important issues about race that need to be discussed." 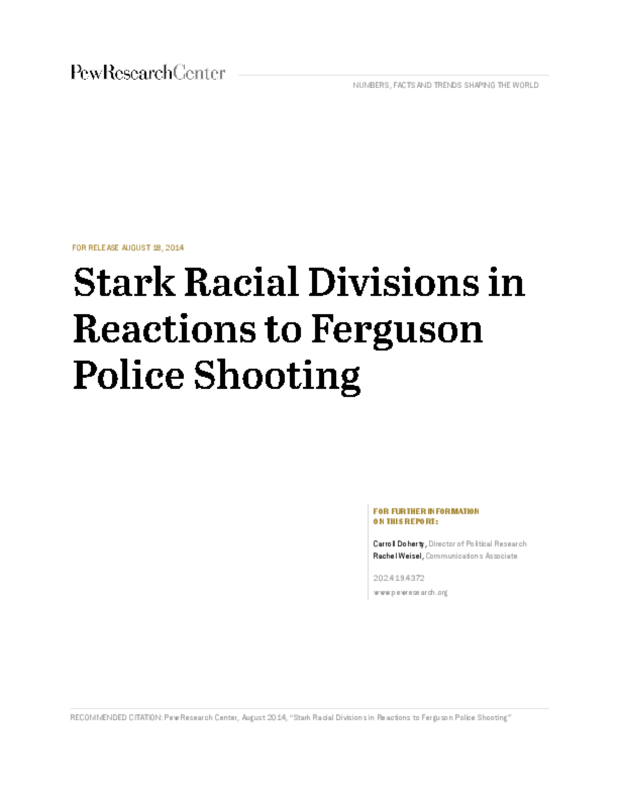 Wide racial differences also are evident in opinions about of whether local police went too far in the aftermath of Brown's death, and in confidence in the investigations into the shooting. 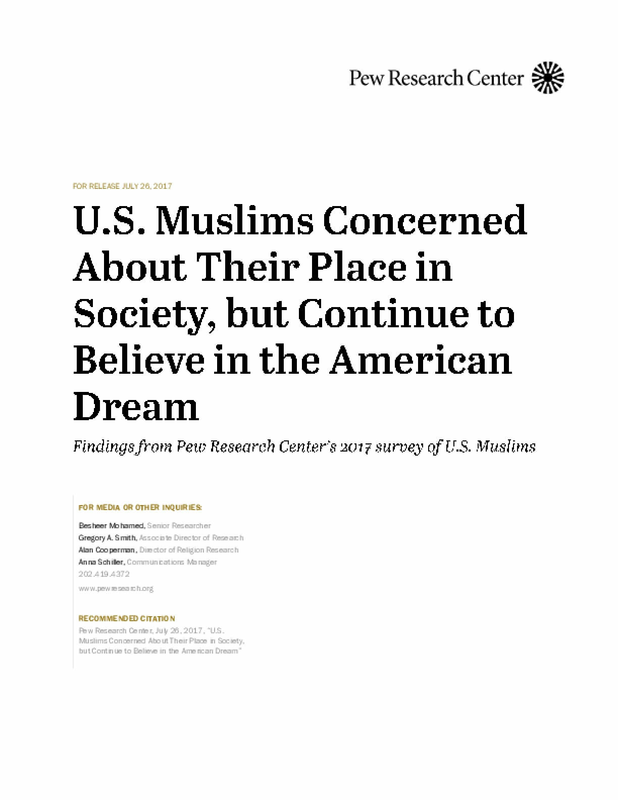 The new national survey by the Pew Research Center, conducted Aug. 14-17 among 1,000 adults, finds that the public overall is divided over whether Brown's shooting raises important issues about race or whether the issue of race is getting more attention than it deserves: 44% think the case does raise important issues about race that require discussion, while 40% say the issue of race is getting more attention than it deserves. By about four-to-one (80% to 18%), African Americans say the shooting in Ferguson raises important issues about race that merit discussion. By contrast, whites, by 47% to 37%, say the issue of race is getting more attention than it deserves. 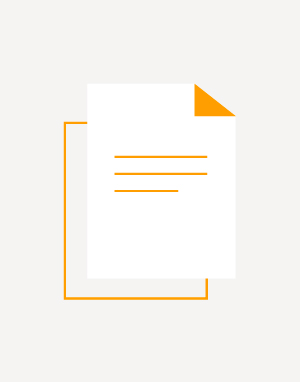 This report presents findings from a survey of Latinos regarding their perceptions of law enforcement authorities in light of the greater involvement of police in immigration enforcement. Lake Research Partners designed and administered a randomized telephone survey of 2,004 Latinos living in the counties of Cook (Chicago), Harris (Houston), Los Angeles, and Maricopa (Phoenix). 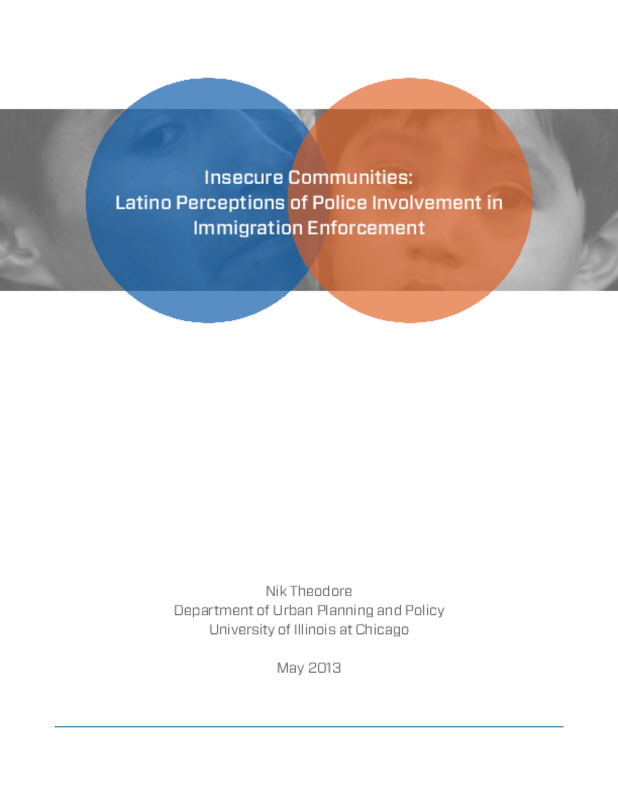 The survey was designed to assess the impact of police involvement in immigration enforcement on Latinos' perceptions of public safety and their willingness to contact the police when crimes have been committed. The survey was conducted in English and Spanish by professional interviewers during the period November 17 to December 10, 2012. Survey results indicate that the increased involvement of police in immigration enforcement has significantly heightened the fears many Latinos have of the police, contributing to their social isolation and exacerbating their mistrust of law enforcement authorities. These findings reveal one of the unintended consequences of the involvement of state and local police in immigration enforcement -- a reduction in public safety as Latinos' mistrust of the police increases as a result of the involvement of police in immigration enforcement. 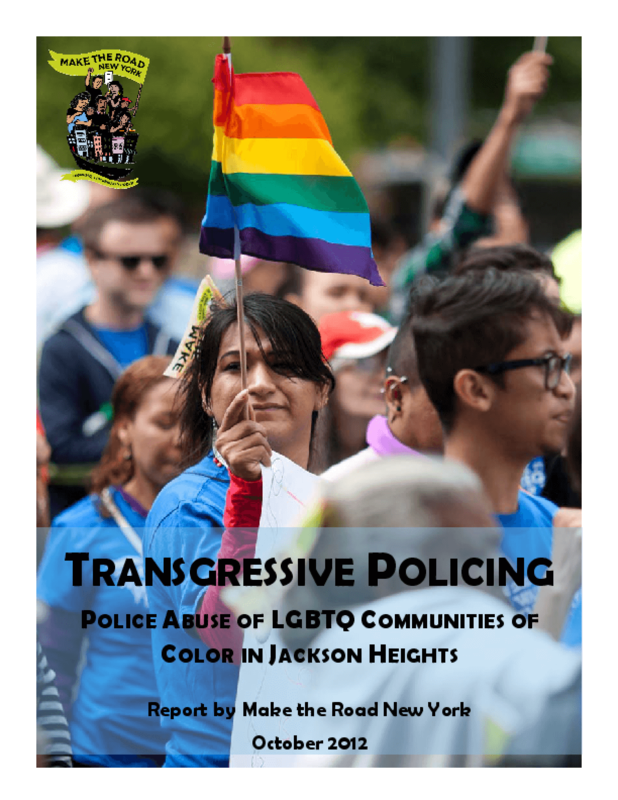 After hearing numerous complaints of police abuse and misconduct against LGBTQ people in Jackson Heights, Queens, Make the Road New York (with help from the Anti-Violence Project) surveyed over 300 Queens residents about their experiences with police in the neighborhood. The survey findings and individual testimonies reveal a disturbing and systemic pattern of police harassment, violence, and intimidation directed at LGBTQ community members. The discriminatory use of "stop and frisks" in the policing of communities of color has been well documented -- the 110th and 115th precincts that are responsible for policing Jackson Heights had 90%-93% rates of stop and frisk activity towards people of color in 2011. Our survey reveals, however, that within this community LGBTQ people of color are particularly targeted. 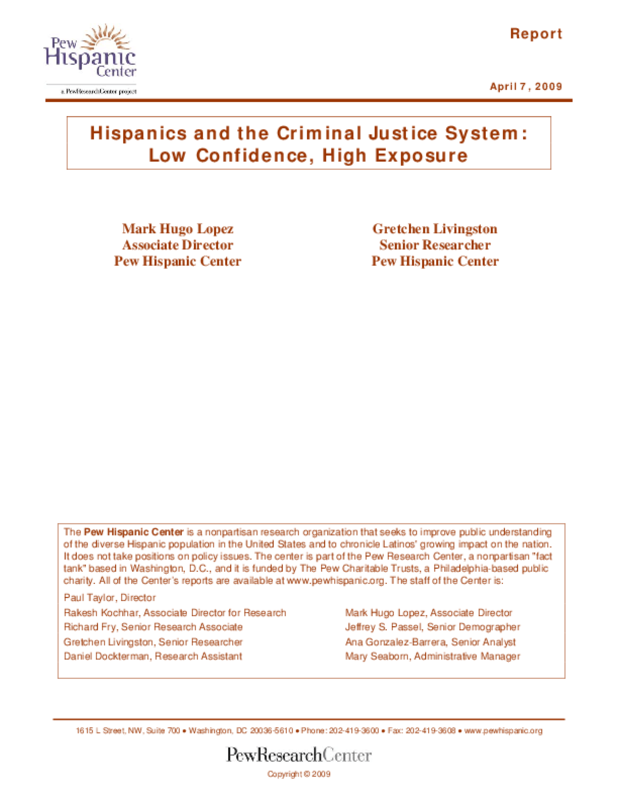 Analyzes results of a survey of Latinos/Hispanics on their exposure to the U.S. criminal justice system and their confidence in the effectiveness and fairness of the police and the courts. Compares data by age and nativity and with those of other groups.